Lacking the network of preexisting business customers, and B2B distribution channels of it’s principal rival IBM, Apple’s success was midwife’d by a hodge-podge of independent resellers and enthusiasts. It seems apropos, on this the 25th anniversary of the Macintosh, to celebrate one of the few that remain of this early band of crazy ones, misfits and rebels, without whom Apple Computer would be little more than a footnote. Richard Hardin didn’t intend to get into the computer business. His company, Hardin Electronics, started selling Norelco tape recorders in 1967,and ultimately grew into installing high-end PA systems in churches. As his business grew, Hardin looked at an Apple II to help him with the books, but rather than buying the computer, his entrepreneurial spirit drove him to become an Apple dealer –and the rest is, as they say, history. Of course ‘History‘, is never so neat and tidy. Richard’s boys run the store now; Louis and Rick grew up apace with Apple Computer, and recount stories of the innocence of youth, and the complications that come with an ‘adult relationship‘ with Apple where they are competitors as often as allies. “When the Apple IIc came out in 1984, I would take it to my friends house and connecting it to their TV through an RF modulator. Most people thought my dad was crazy for letting a 12 year old take a top of the line computer around to peoples houses to play games. As teens, we would tote around a Mac SE or Classic around in an all-in-one bag to church or any place we had time to kill. Now a days have never been more challenging for the Hardin brothers, yet their optimism and business flourishes. They prosper by providing services Apple doesn’t, on-site service, consulting, and networking. Many of which are referrals from Apple. “Their service ends at the door,” says Rick. “They can’t leave the store to go to their customers, and there’s a lot of Macs that are too old for them to work on. For these, Apple refers customers to us.” In fact it was my friend Dave at the Southlake Apple store referred me to them, when he couldn’t sell me a part I needed to repair my MB Pro. The total time from when Hardin ordered the part for me, to my picking it up? Eighteen hours. That too is, I suspect a big part of their success. While corporate stores have got the style and flavor of San Francisco, and better retail sales per foot than Cartier, there is just something so Texas about Hardin computer. As you see, there aren’t horseshoes or stuffed deer on the wall. 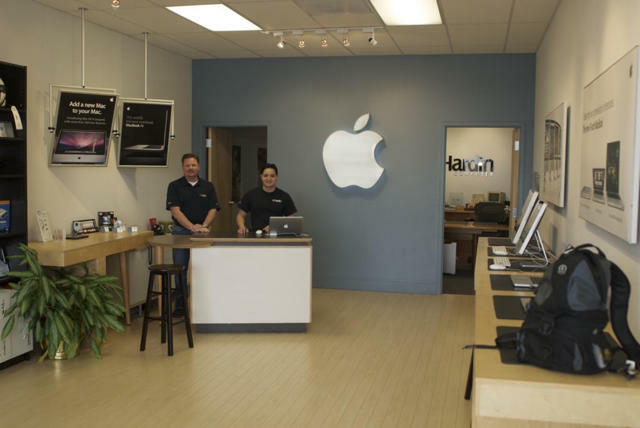 The store maintains the design language of Apple, but instead of the dispassionate chic of the Genius Bar, the Hardin brothers and their staff seem genuinely interested in helping you. “For a lot of people, we’re just more accessible than the company stores, “ says Rick. 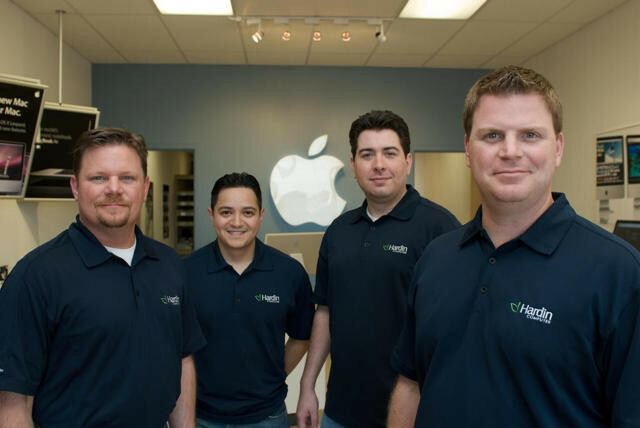 Their reputation for down-home friendly, Texas, type service is recognized by Apple; the company having recently been awarded them the Commitment to Service Award, making them among the top 5% of Apple service centers in the country. 5717 SW Green Oaks Blvd , Arlington, TX 76017, or on the web here. I would like to hear from you, is there an Independent Apple Store in your neighborhood you’d like to celebrate? Let me know in the comments, and I’ll collect them up for a bigger piece.